We held our morning training session today at the National Sports stadium as we prepare for our match against Chicken Inn next Wednesday. All players reported on duty except for Kudzai Nyamupfukudza who is nursing an injury. In our casualty ward, we had John Zhuwawu, Milton Ncube and Valentine Musasurwa. Training will continue tomorrow at the same venue. 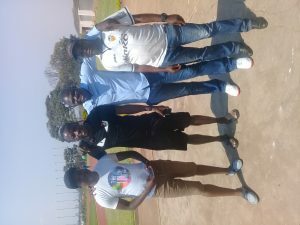 Our session was graced by the presence of Warriors forward Nyasha Mushekwi. Mushekwi donated some goodies to the players and technical team. Enter your email address to subscribe to capsutd.com and receive notifications of new posts by email.